Sunday, Portland Trail Blazers star guard Damian Lillard was spotted walking around the campus of Palisades Charter High School, in the ritzy Los Angeles neighborhood of Pacific Palisades. The two-time All-Star had recently concluded an appearance at the Matt Barnes Basketball Camp, which was taking place in the school’s gymnasium. 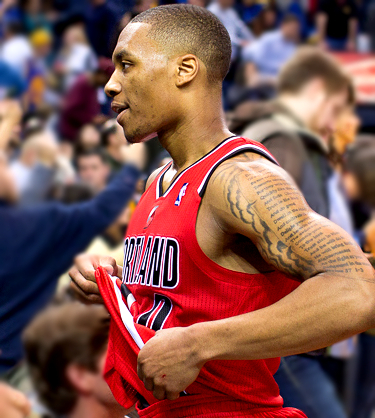 Last season, Lillard, the 2013 rookie of the year, averaged an outstanding 25.1 points and 6.8 assists for the 44-38 Blazers. After being selected with the sixth pick in the 2012 draft, the Oakland native has quickly emerged as one of the very best players in the NBA. In a related note, a source tells iFolloSports.com that Clippers superstar Chris Paul stopped through the Barnes camp on Saturday.